Straight to the reviews again, beginning with Trinity Seven – Complete Season Collection. It might not appeal to the ‘seen it all before’ crowd, but if you’re relatively new to anime, and have a hankering to see a harem comedy, then Trinity Seven is pretty close to a genre standard, taking a pleasantly perverted teen male, and putting him in the midst of several beauties, most of whom fall for his questionable charms in some way. It’s saucy silliness, the anime equivalent of a Carry On movie, but it’s also got a fair story to it, an imaginative magical world, with a couple of unexpected twists and turns. Speaking of having seen it all before, we’re up to Naruto Shippuden: Box Set 26. The long running shonen action show about a luminescent orange ninja just keeps on trucking, and we’re well in the middle of the fourth great Ninja War. This collection of 13 episodes actually has no filler to it, which is a change, and it’s replete with action and story developments. Previously, this would have been the Naruto that I would have crowed about, the best of the good stuff. Click on the review to see if this is still the case. 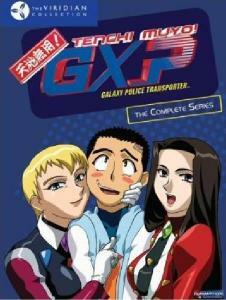 Tenchi Muyo GXP. This is one of the shows that almost made it to the UK, but not quite. Back when Revelation Films were distributing for Funimation, they announced it alongside the third Tenchi Muyo OVA series. The latter made it to release, in a sandwich tin, but not GXP, which is a shame. For me it’s the only Shinichi Watanabe comedy to hold up. Shows like Excel Saga and Puni Puni Poemy were great for the first watch, but the second time around the joke fell flat, and Nabeshin’s cameos became tiresome. Tenchi Muyo GXP has the same humour, but it also has the strength of a great storyline. It’s a proper harem comedy with a nice bit of sci-fi, and it also has a bit of heart to it as well. A hapless Earthling gets recruited by the Galaxy Police by mistake, but it turns out that his bad luck is a useful weapon against space pirates. And all the hottest women fall for him, despite how oblivious he remains to the attention. The best moments for me are when it crosses over with the original Tenchi Muyo. Funimation released it originally in eight single volumes, long, long ago. I imported the Viridian Collection, probably its third release, back when Funimation thought it was a good idea to save the environment by packing the discs in card sleeves so they’d be pre-scratched. Here’s my review. If you’re looking to get it now, it’s in the more sensible S.A.V.E. packaging, and will set you back around £15 to £20 to import. 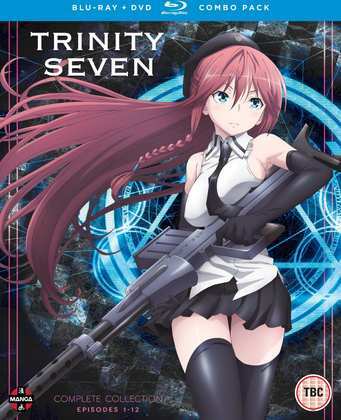 Trinity Seven – Complete Season Collection was released as a BD/DVD combo last Monday by Manga Entertainment. 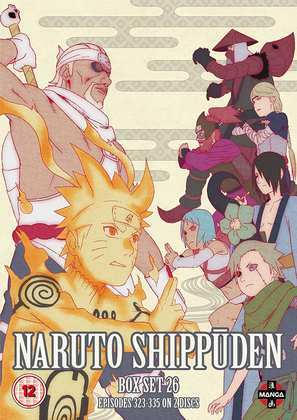 They also release Naruto Shippuden Box Set 26 today on DVD.